Because of the whole "weekend in the 'burbs" thing, I missed my usual Sunday guilty pleasure of The Apprentice, but I finally got to watch it tonight. 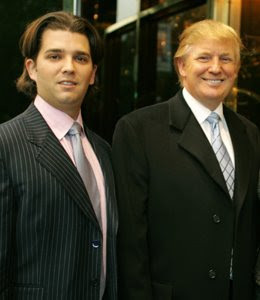 There was one particular shot where The Donald is giving out the assignments to the "celebrities" and is flanked by his yummy daughter, Ivanka, and his son, Donald, Jr.
Me, I wear a blazer with a pair of jeans or khakis, and it's not even close. Ok, it's a $400 blazer, but you know what, it's still how you wear it. Also annoying is how they keep calling Donald, Sr. "Mr. Trump." Ugh. Stop it. I was on his yacht several years ago for some party (he's since had to sell the boat - his "empire" is really just smoke and mirrors these days, just saying) - anyhoo, trust me, no one in real life is calling him "Mr. Trump" except for schtick. Another little Trump note; I once had to bring The Donald's (now) wife, Melania, to a few media appearances when she was a guest "correspondent" for a show I was then working on. She is seriously a doll. Not only gorgeous, but a lot of fun and incredibly nice to hang with. So, for that, I will give him "Mr. Trump."